Angkor Wat is the major attraction that brings millions of visitors to the country each year. The 9-11th century temples are all located in a massive archeological complex giving us a small glimpse into the religious happenings in the country during the reign of Kings like Jayavarman VII who built several temples in the complex. There are many options when planning your visit to Angkor Wat and people spend precious travel time trying to plan the best route to see each major temple, finding the quiet tourist free spots and plotting their locations for those epic sunrise and sunset shots. There are one, three and seven-day passes to gain access to the property and backpackers breezing through Siem Reap will often try to conquer the complex in a day. 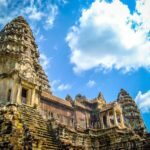 If you start at Angkor Wat at sunrise, by lunchtime you will be cross-eyed from looking at carvings, climbing pagoda stairs and learning of the massive amount of history that is attached to each location. Do yourself a favor and add an extra day or so to take your time and break up the sightseeing. The temples start to mesh together after a while and you won’t truly appreciate the story of the buildings and the beauty if you cram it into one tour. Trying to master currency conversions can be confusing if you are working with only one exchange rate but in Cambodia it seems that you can use just about anything. I’ve never been to another country where I could use their local currency, (Riel), US dollar, Euro, and I even managed to offload some of my extra Indonesian Rupiah. My advice is to stick to one currency and that way you are less likely to be confused and possibly not receive correct change. If you pay in US dollars you are likely to get Riel back in small bills so do yourself a favor and brush up on exchange rates before you go. XE Currency has a great app that conveniently lets you move from different monies to keep you in the know when rates change. Several other Southeast Asian countries may take the lead in crystal blue waters and squeaky sand beaches but Cambodia has several popular destinations that are also a little slice of paradise and make for a fabulous location for a break from the cultural tourism. Sihanoukville is the more famous beach location and is a busy backpacker hub. Look further down from the main party to Otres Beaches (I, II & III) for a more relaxing atmosphere. A short boat ride away are several pristine locations, perfect for a day trip or to spend a few days in a beach bungalow and unwind. Koh Rong is the more famous and now seems to be marketed towards the partying twenty-something on gap year. To find the smaller, quieter spots head to Koh Rong Samloem where you can achieve the feeling of being marooned on an island all to yourself. Kep is another serene beach town with even fewer tourists and some amazing eco lodges on the base of the National Forest. They are known for their tasty blue crab and on weekends the beach is populated with families from the surrounding provinces taking an afternoon picnic and enjoying the sunshine with friends and family. Kep has a day trip to Rabbit Island, which has a similar vibe to the other less populated islands. You will always find a lackadaisical atmosphere in tropical climates. The pace is a little slower and naps are more regular occurrence but the Cambodian people take their rest time very seriously and hammocks are quickly spotted everywhere you turn. The tuk tuk drivers stow them away in their seats and they will tie them to their cabs for an afternoon siesta, shop owners will have them attached to their front porches, usually with a sleeping child gently rocking back and forth and multicolored nets are always swaying from guesthouse entryways, waving you in with a welcome. It quickly becomes a game to spot where a piece of fabric will ultimately be hung and I had even spotted a woman quickly weaving several vines together onto a tree by her roadside stand for a spot to sit. Kick up your feet; it is a great way to get ingratiated in the culture while taking time to relax on your holiday. The history of the Cambodian people within our lifetime has come with some tragic tales. The Khmer Rouge had decimated a large part of the population in the 70’s and it’s estimated that around 2 million people were murdered during the rule of Pol Pot. Even with such a dark past the local people are excited to share their traditions and customs and are happy to show their country to visitors. There is an increasing problem in Phnom Penh with street theft and my bag was snagged by a motor biker a few days before I was due to depart and even with that experience I left with a bright view of the people I encountered. Instead of leaving a bad taste in my mouth, I will have fond memories of the people and their positivity.